Are you missing a tooth? Have you lost multiple teeth? And are you not sure what your best option is to replace those teeth? Well if you’re seeking for the best treatment and results, a dental implant may just be it. A dental implant is the next best thing to natural, healthy looking teeth. Leaving empty spaces in your mouth after losing one or more teeth can lead to loss and deterioration of some of your jawbone when it is not being used to support a natural tooth, losing its strength and firmness. Dental implants are the only dental restoration option that preserves and stimulates natural bone, actually helping to stimulate bone growth and prevent bone loss. Other options interfere with your speech, eating, smiling and can lead to bone deterioration. 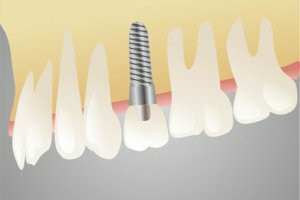 Dental implants go directly in place of the missing tooth without impacting other healthy teeth in your mouth. They also help prevent healthy, adjacent teeth from shifting as they would if an empty space were left for an extended period of time. Cavities can not occur in an implant-restored crown, however, you will need to visit your dentist for scheduled cleanings and care for the implant. You also need to care for your gums and mouth every day, the same as you would if it were a natural tooth. Dental implant treatment has a track record of reliable, long-term successful outcome. One last thing to remember is that not everyone is a candidate for dental implants , so make sure to have a proper evaluation and consultation with Dr Changela, trusted Chino Hills dentist. Please call us at 909-606-9907 for your free implant consultation.